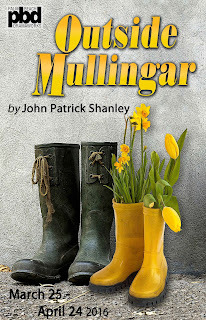 Having recently concluded its run of Long Day’s Journey Into Night, Dramaworks turns to a moving romantic comedy, John Patrick Shanley’s Outside Mullingar. It is a well chosen change of pace which will be warmly greeted by Dramaworks’ audience. On the surface, it’s a familiar formula of two star-crossed lovers who initially don’t seem to like each other or can’t get together because of some obstacle. All we have to do is to find out how love finally prevails. It worked well in one of John Patrick Shanley’s best known works, a movie, Moonstruck. 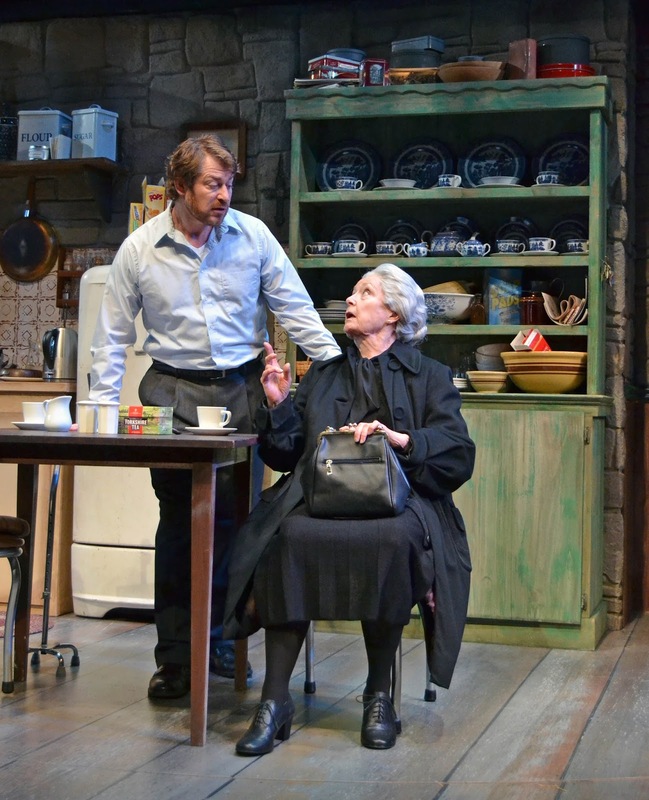 His Tony award-winning drama Doubt: A Parable was something quite different though, about possible sexual misconduct in the Priesthood leaving the audience in “doubt” about the resolution. 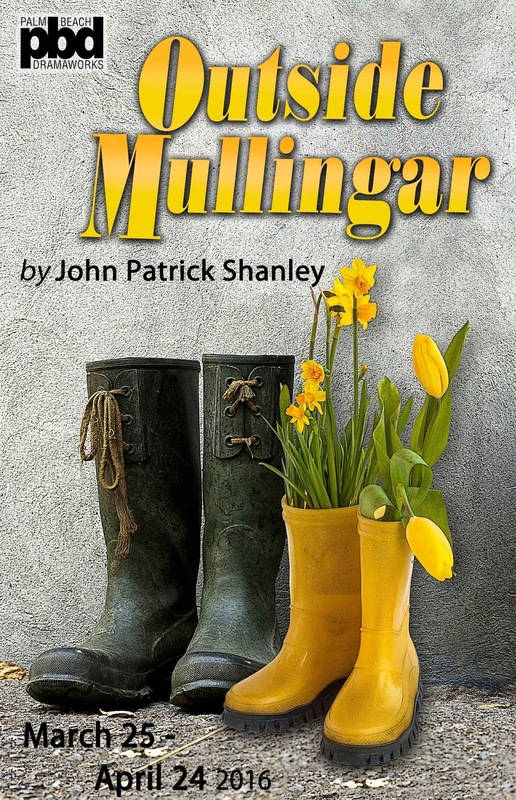 An excellent production of that play was put on by the Maltz Jupiter Theatre three years ago, directed by none other than J. Barry Lewis, the director of Outside Mullingar. This is a delicate but sometimes melodramatic tale of unrequited love. And what do we have in Ireland? Rain. Lots of it. As well as loneliness, isolation and repressed feelings. Plus we have old family farms in the Midlands, one owned by the Reilly’s and the other by the Muldoon’s. They are side by side, but there is frontage between the two which old man Reilly, Tony, sold to old man Chris Muldoon almost thirty years ago, Reilly considering it a loan and Muldoon considering it a sale. Reilly wanted the money at the time for a particular purpose which we later discover is an important turning point in the play. Muldoon promptly deeded the frontage to his daughter, Rosemary. Why? Because she asked for it. It is where Tony’s son, Anthony, pushed her over when she was seven and he was thirteen and she wanted the land to ultimately hold it out, seemingly as revenge (although we later find out it is for love). Very prescient for a young girl. Time has come to cash in her chip. Her father’s funeral was just held, and dreamy-eyed Anthony invites Chris Muldoon’s widow Aoife and Rosemary over to the Reilly home afterwards, at the objection of his father who says, “Ah you’re half woman.” Rosemary at first does not show, enjoying her cigarette outside in the rain. Instead there is a humorous but sometimes confrontational discussion between Tony and Aoife about their inevitable demise and how they will leave their farms. Alex Wipf compellingly and comically plays Anthony's father, Tony, with a stubborn pride in the land and of his dominion over it. He’s a cantankerous old man, hardly acknowledging he has not done most of the work on the farm for years and his days are numbered with breathing difficulties. Rosemary's mother, Aoife, is played by Patricia Kilgarriff who carries her role with a deadpan hilarity at times, hoping her pacemaker can keep up with the conflict. She is a perfect foil for Tony. Rosemary is in line for the Muldoon farm but Tony does not feel Anthony is a true “Reilly,” someone who loves the farm and land as he should. No, he thinks he takes after his deceased wife’s family, the Kelly’s - a little daft in the head (“John Kelly put his dog on trail for slander”). He has already thought of selling the farm to an American cousin (a Reilly of course), hoping to leave money to Anthony so he doesn’t feel slighted. But he needs the frontage to sell the farm. And now Rosemary’s owns it! But Anthony always seems to be out in the fields, either meditatively walking or working hard. One would think this is where he belongs. Except Anthony has a secret, which he once revealed to his one and only past love, Fiona, long ago. But when “I opened my heart to her she ran like the wind.” “She ran like fire.” What kind of a terrible secret could it be? Might he be a morphodite Rosemary wonders? It is yet another dramatic element that John Patrick Shanley holds out for the end. Although Rosemary doesn’t appear in the first scene, you already have the sense that she is feisty, a real Irish lass; but the flip side of her anger is romantic longings. She’s loved Anthony all those years. Will they ever get together? She furiously turns upon Tony in the third scene, castigating and shaming him to such a degree about his plan to turn over the farm to anyone but Anthony that he finally relents. It is just one of Rosemary’s several intense moments in the play, which Kathy McCafferty portrays with a full range of emotions, passion, pain, humor, and prideful joy. McCafferty shines in the role. It is several months later and Anthony is nursing his father in his bedroom. He is dying and his son now knows he is inheriting the farm (not aware of Rosemary’s role in the decision). Nick Hetherington’s Anthony has a hang-dog look most of the time but his sullen soulfulness reveals he’s more poet than daft. It’s a difficult role to play and Hetherington carries it with a certain amount of humorous naiveté, often puzzled by Rosemary’s reactions to much of what he says. Three years pass after the death of both Tony and Aoife, but Anthony still doesn’t seem to have a clue about Rosemary’s feelings – or be willing to follow his own in fact. They hardly see each other except across the frontage, until one day Rosemary spies Tony in the rain with a metal detector, something she’s seen him with before. She insists he come into her house, out of the rain, and it is there that Shanley works his way towards a fiery denouement, when the “secret,” along with a coincidence -- a “sign” so typical in Irish mythology – are both revealed. One could say it is a contrived ending but if you give yourself over to the play, it is amusing and satisfying, as “the pain of love” emerges. The sun shines. We all want happy endings and this one is wrapped in feel-good four leaf clover and delivered with the lyricism of the Irish theatre. Shanley’s deep affection for his flawed but real characters comes through in a very crisply crafted script. It is elegant, threadbare writing with the comedic elements woven in its romantic and dramatic undercurrent. The director, J. Barry Lewis, seamlessly orchestrates this delicate play so it can leap to life before our eyes. He confesses to Rosemary that “My life is fixed down with a rock on each corner.” She asks “by what?” He replies: “There’s the green fields, and the animals living off them. And over that there’s us, living off the animals. And over that there’s that which tends to us and lives off us. Whatever that is, it holds me here. No. The voice I hear in the fields wants me in the fields.” It sums up hundreds of years of Irish misery and history. The lyricism of the language lives, and the wonderful cast makes this seem like a slice of real life. In spite of this being only a four person play, it is complicated to stage as there is the passage of some four years during the play and there are five specific locations which challenges any production company, having to make the choice between a representational set, or frequent set changes with darkened interruptions, or, as in the case of Dramaworks a rotating stage. This enables the play to maintain its pace, with well defined sets for each scene, and for a representational depiction of the three year interval before the last scene. Scenic and lighting design by Paul Black takes full advantage of the Dramaworks’ stage (as well as its limitations, it being much wider than deep, the outdoor scenes being performed down stage left and right). The land and the sky are prominent and those are weighty themes in the play itself. 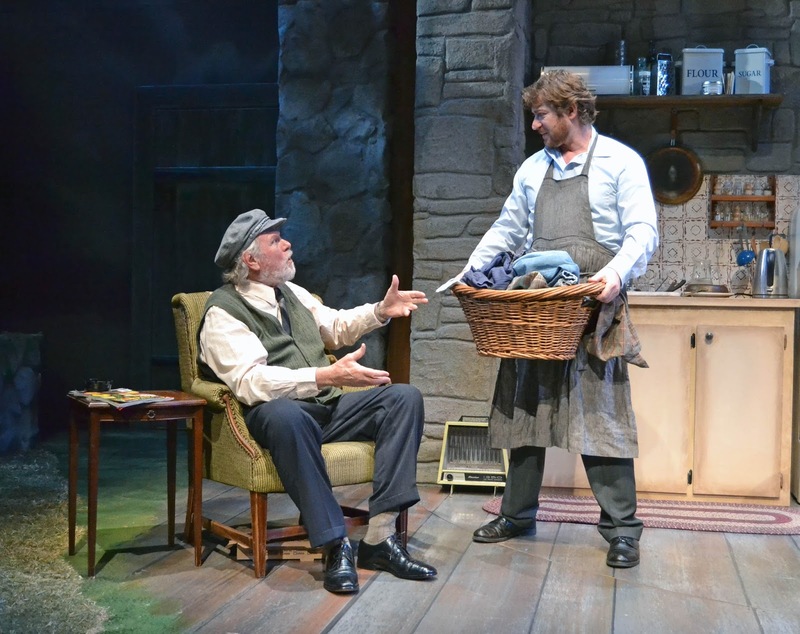 Although this is a contemporary play, the props are straight out of the 1950s, conveying the multigenerational nature of the farms. Sound design by Steve Shapiro is yet another element enhancing the art of presentation. There are the requisite occasional barking dogs and a train in the distance. But most noticeable is the omnipresent rain, in various pitches that add to the gloom and then with the rarely blazing sun, a residual rain falling off the trees or from gutters. There are also the well timed claps of thunder and lightning, or ominous rumbling thunder. And the music Shanley chooses for some of the play’s intervals and for the background as the play closes is a beloved Irish/Scottish song, “The Wild Mountain Thyme.” Some of the characters occasionally sing verses from it. Costume design is by Leslye Menshouse, reflecting what these contemporary working people of Ireland wear, and having to connote the passage of time from the beginning of the play to the end. Costumes also have to reflect the inevitably of inclement weather. There are several quick changes (including one on stage). And as this is Irish theatre there is the notable work of dialect coach Ben Furey. The brogue spoken here is undeniably Irish (and more reflective of the Midlands) but thankfully clear to the audience. But not enough praise can be heaped upon one of South Florida’s leading directors, J. Barry Lewis, and the cast, all professional actors from New York City, making their Dramaworks debuts. One can tell that his is a tight knit group, “singing” Shanley’s vision of his Irish roots in perfect harmony. 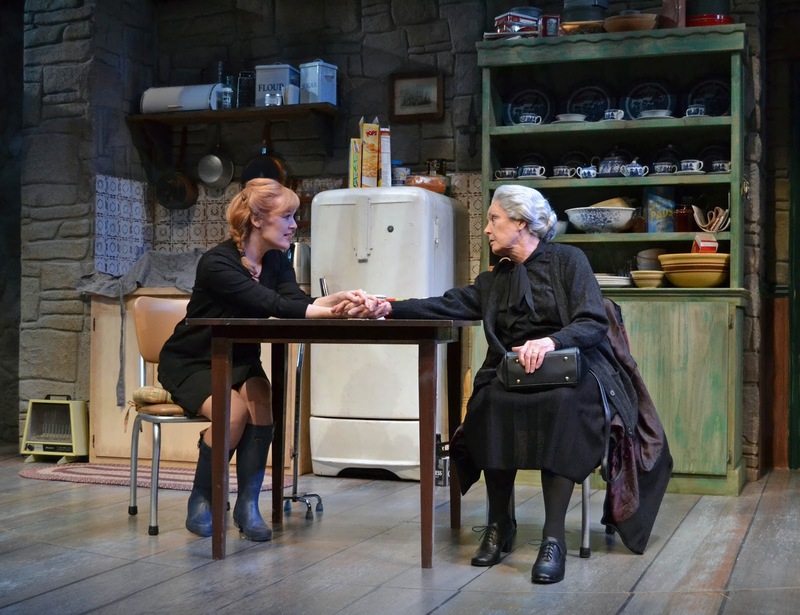 The last Irish play put on by Dramaworks was The Beauty Queen of Leenane, which was a straight forward tragedy. Outside Mullingar although arising out of Irish sadness is a successful romantic comedy and another high-quality achievement by Dramaworks. ---- Pope John Paul II from a speech to the people of Galway, September 1979.